Eight images of Art Nouveau Period Ladies. You can use these images as toppers for small greetings cards, gift cards, notelets etc. or as ATC Cards. ATC Cards are miniature artworks on a card measuring 3.5" x 2.5" (this size is industry standard). 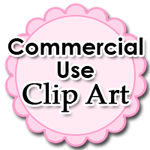 They can be from Vintage images, Clipart or from original artworks painted or drawn by the artist. They are swapped at special meetings or by post via the internet. Collectors will swap either individual cards or full sets. Both Personal and Commercial use is OK but when using as cards etc; they must not be sold on in their original state but must form part of your own design. 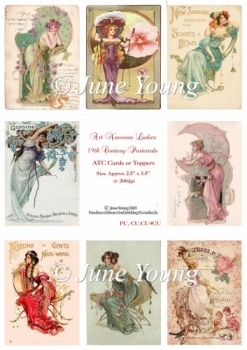 These images are at 300dpi so can be enlarged to suit your card-making.